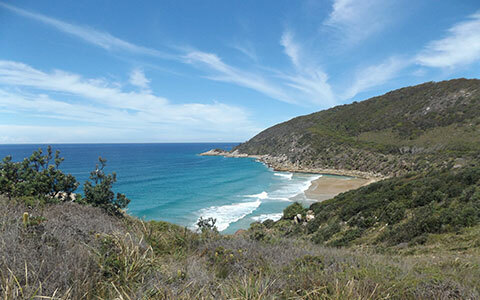 On the mid north coast of New South Wales, there are many secret small coves like this one, usually in national parks and accessed by foot. 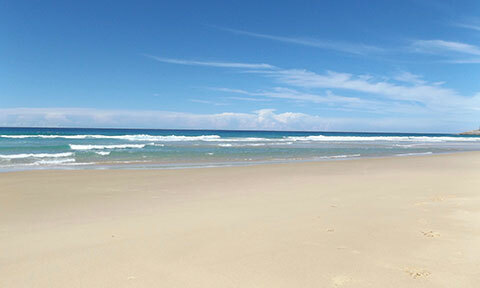 You may see another person or two there, but seldom more. 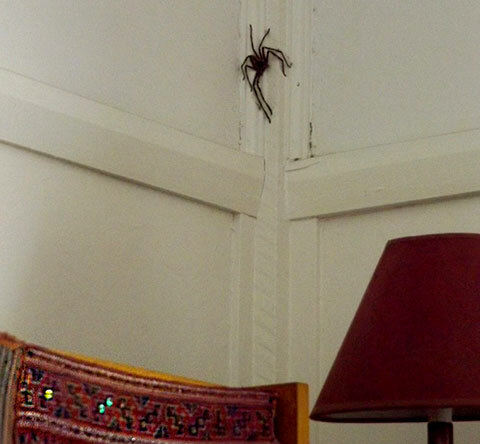 But other creatures actually live there! 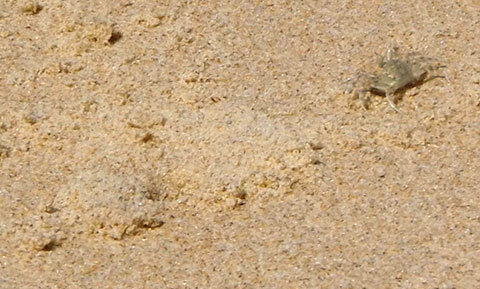 Like this perfectly camouflaged tiny crab, who kept disappearing and then popping back up at my feet, to scuttle further away. 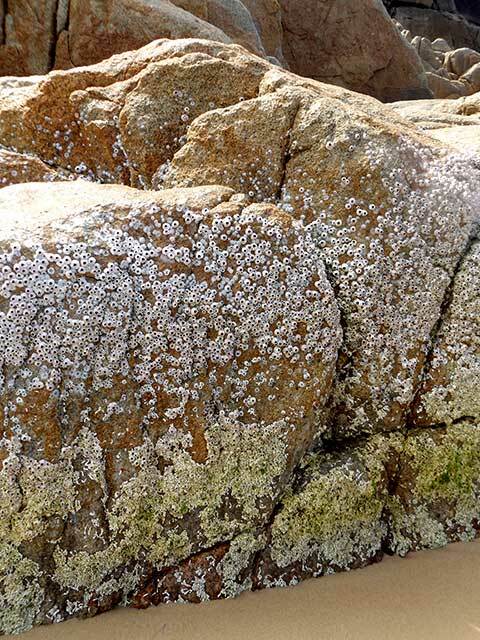 The tide being low, the bands of evidence of other cove dwellers were in plain sight – the shell homes of upper level barnacles and then those of the galeolaria worms. Almost perfectly demarcated. 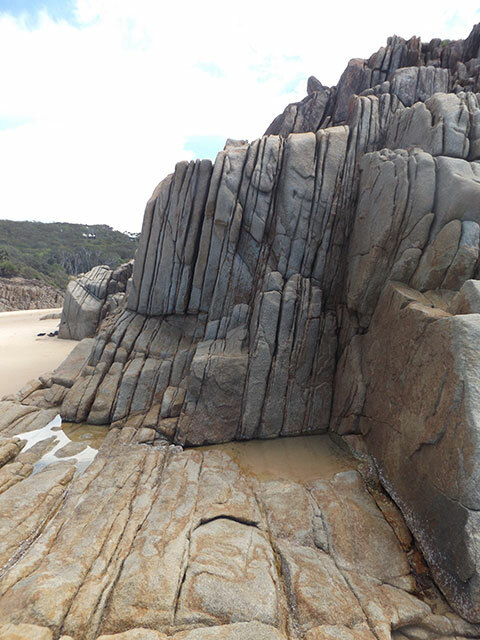 This was not a marine rock platform, so there were lower tide dwellers, plant or animal, but I found a few at the feet of the densely populated rocks. 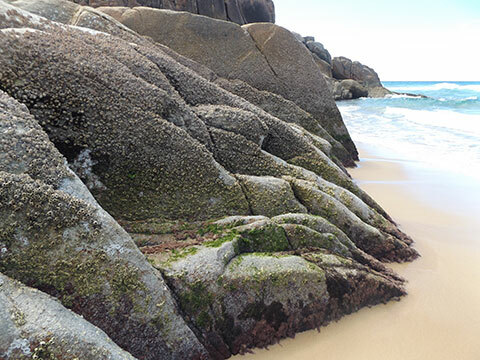 The shore bound rocks are even more spectacular, sliced and split and stacked so very neatly. Nature is amazing! 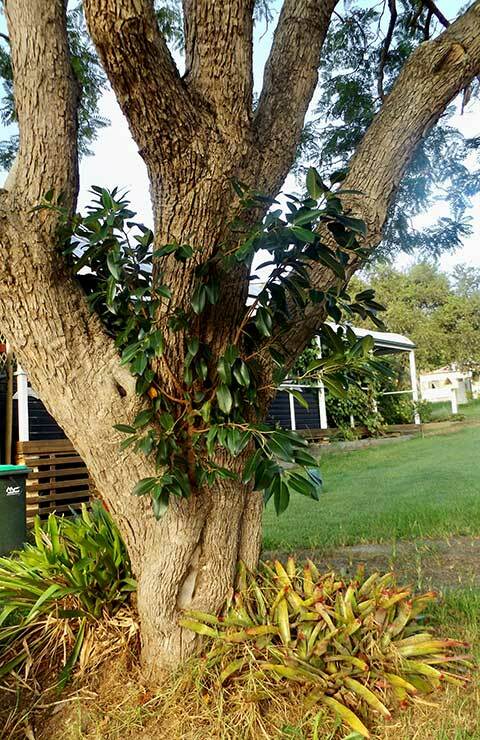 I love the large Jacaranda tree outside my house, even if it is an introduced tree that self-seeds rather too readily. 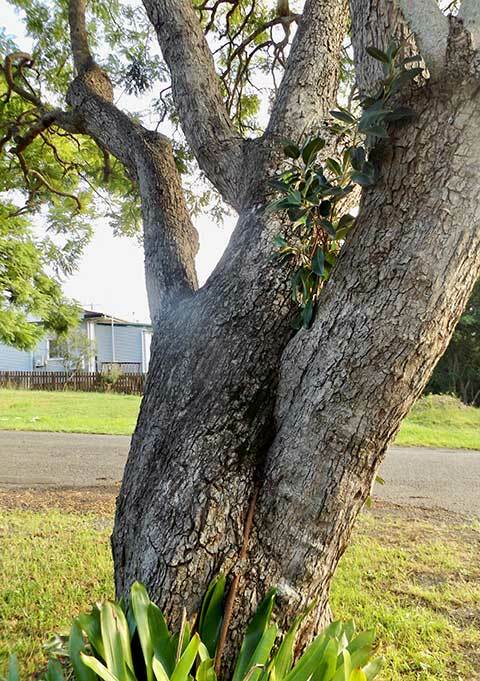 But over the last year I have watched a Strangler Fig that some passing bird has seeded in the Jacaranda fork steadily grow larger. 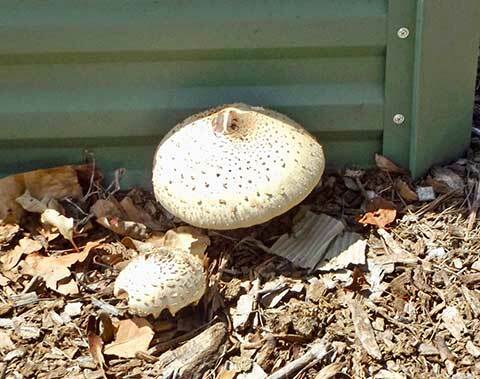 But eventually it will ‘strangle’ the host, as I see so many enormous ones have done in the Wingham Brush. 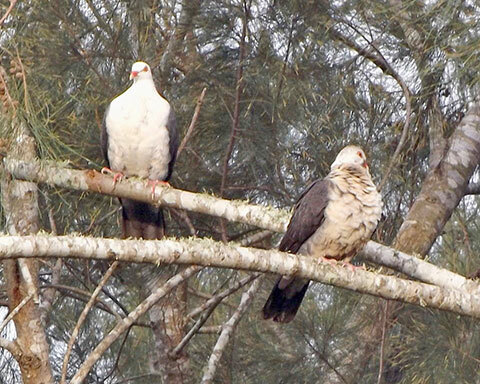 They would be food for the Greyheaded flying foxes and the Whiteheaded Pigeons I see here. But the Jacaranda is deciduous and allows my solar panels winter sun; the fig will not. But just look at the spiderwebs in that fork and the fig roots inching earthwards. This is a natural process; I don’t feel I have the right to intervene, like a gardener. With rain every few days and humidity almost liquid — or it is on my person! 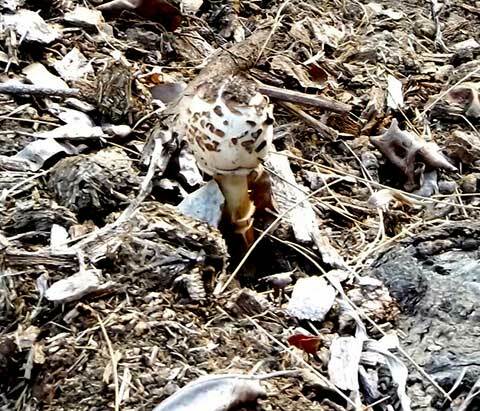 — fungi are thriving. Nothing spectacular or colourful, some rather shy and delicate, but each different in an unassuming way. 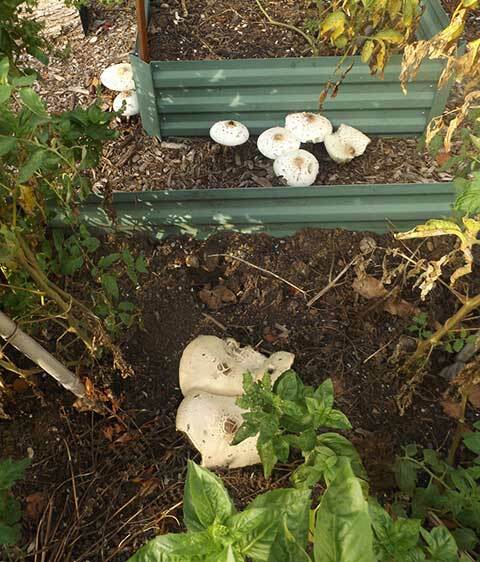 And the large colony amongst my raised garden beds is still renewing itself, growing larger and more fleshy each time. I love flowers and foliage, but fungi are more fascinating! 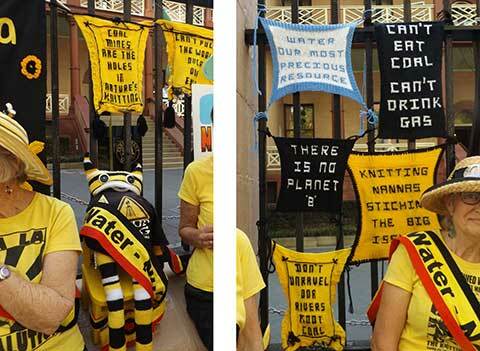 What better way to mark International Womens Day 2019 than for 120 KNAGs (Knitting Nannas against Gas/Greed) from all over NSW to converge on Sydney to get their message out, ‘United to Protect our Water’. 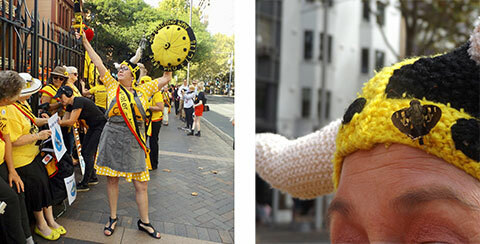 In a yellow and black tide, red-rimmed for solidarity with their indigenous sisters, they met in Martin Place. I’m an honorary KNAG, but my friend Sharyn O’Dell is a real one, so here’s ‘Sharyn2’ in battle-ready mode. CBD workers hurried past the converging Nannas, but at the top of the steps from Martin Place station they couldn’t miss the chanting or singing line-up, including the indomitable Bill Ryan. 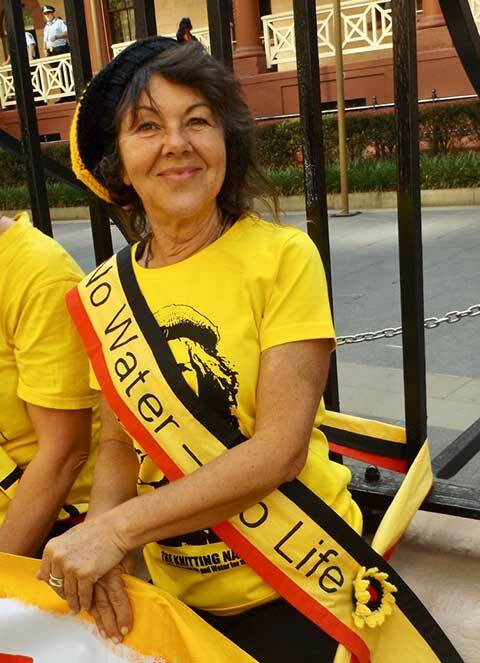 Nannas from Northern Rivers, Grafton, Gloucester, Coonabarabran, New England North-West, MidCoast, Central Coast, Great Lakes, Hunter, Illawarra and Sydney Loops all wore special sashes bearing the truth that must be faced and acted upon by our decision makers: ‘No Water – No Life’. 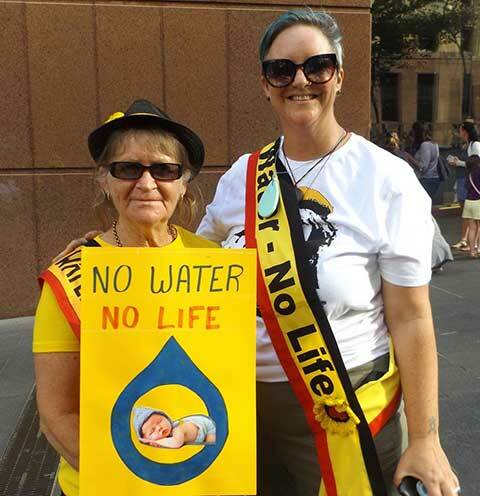 Of course Nannas must be perfectly groomed and dressed, to set a good example for the kiddies, as well as saving our land and water for them. Here Judi Summers gets the final touches from Louise Somerville and Clare Twomey. 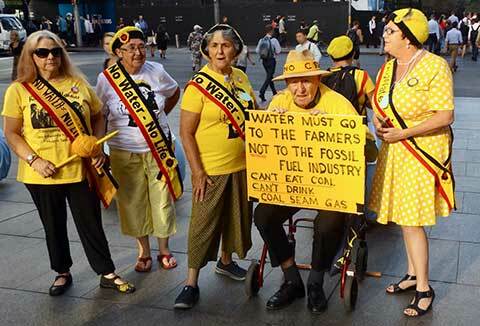 The Nannas love to get together to catch up on the threats and related actions in their Loops, and are a jolly lot – except that they are deadly serious about what our governments are allowing to happen with our precious water and what they are NOT doing on climate change. The recent water licence auction in the north-west, where coal companies bid three times what farmers could and hence got the water, shows that our system does not value water for the right reasons. 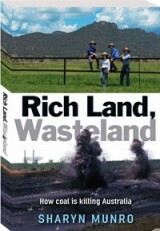 Once more, profit is placed above people and planet. 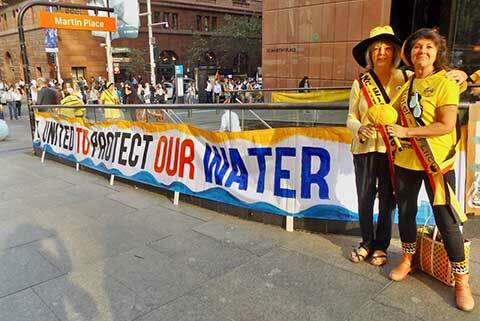 The ever-persistent protector, researcher and documenter Jo Holden was there (right) here with Julia Lee from the Hunter, with a most poignant sign. 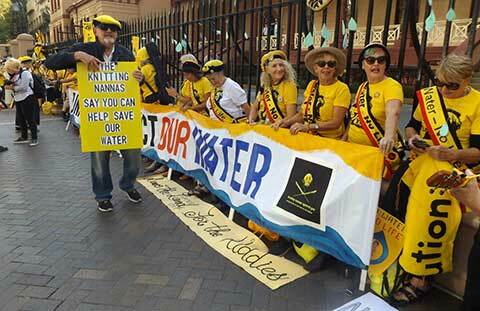 While the KNAGS were kitting up, commuters couldn’t fail to be aware that these Nannas were acting up… as Nanna Felicity made sure with this knitted sign. 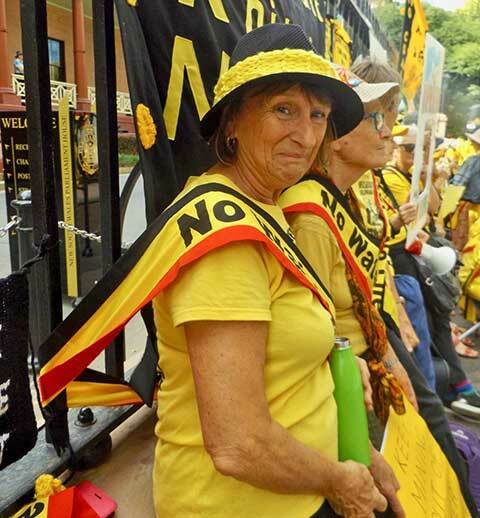 Then the Nannas were ready to take the message to the pollies, to Parliament House. They headed up Martin Place, looking dangerously determined – and sounding it. In fact, at the Lismore inaugural KNAGs conference, in my speech I asked for ideas for a collective noun to suit and the consensus was ‘a determination of Nannas’. Once there, the whole ‘determination’ of 120 KNAGs tied themselves to the railings, suffragette-style, in a ‘soft lock-on’. They only just fitted along the fence. 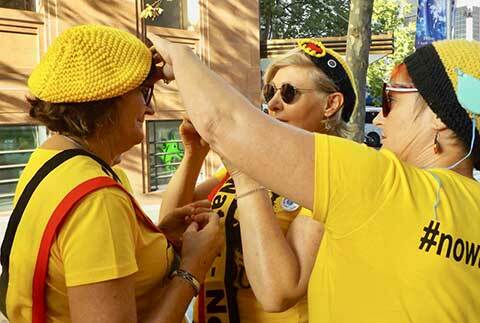 The police watched on; after all, Nannas are harmless … aren’t they? Here they also hung examples of Nanna knitted wit and wisdom, sampler-style. The fearsome Nanna MaryBeth (Brynhildr) from Cairns was there at her most challenging, although this tiny yellow and black insect that chose her helmet did not seem worried. Probably knows the Nannas are saving water for them too. 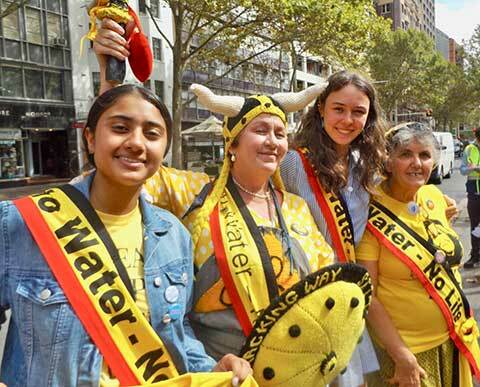 Young Climate activists, Manjot Kaur (17) and Vivienne Paduch (15), shared in the protest, well protected by Nanna Brynhildr and Nanna Angela Dalu from Lismore, two of the most fierce, funny and friendly Nannas. The girls invited all Nannas to join them in the school strikes on March 15. 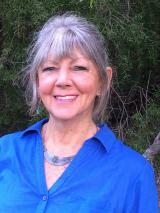 Let’s hope enough politicians pay attention to the Nannas’ Knagging List – and that whoever gets in after March 23, they do what their Nannas tell them. and ‘Don’t forget to keep your promises’! Spot the odd one out amongst the horse poo and mulch chips? I nearly didn’t. But then the choc-chip coated drumstick swam into focus and could not be unseen. 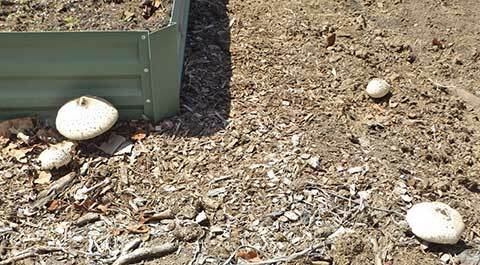 Looking about, I spotted two more beside the raised garden bed, still in the same rough mulch. 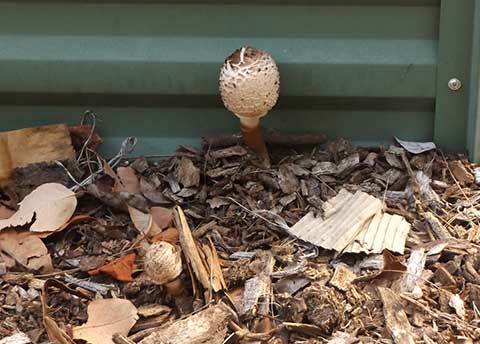 It’s been so dry, I was surprised to see such healthy fleshy fungi popping up. Next day they had opened out considerably, the choc chip look had gone, but the light dusting of chocolate powder in the top centre made them more like the creamy top of a cappuccino. 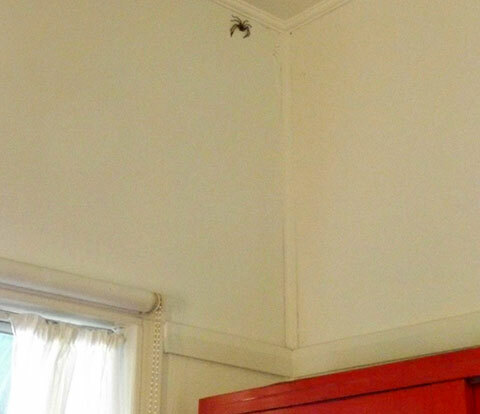 No chance of camouflage now. 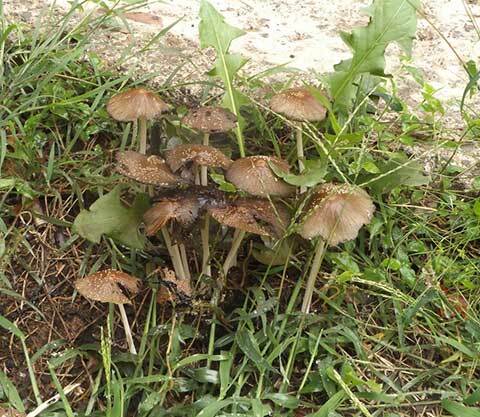 These fungi may be,( I think!) Chlrophyllum molybdites, due to the drumstick start, the slightly bulbous base below ground, and the pale olive greenish gills. I had five in total. 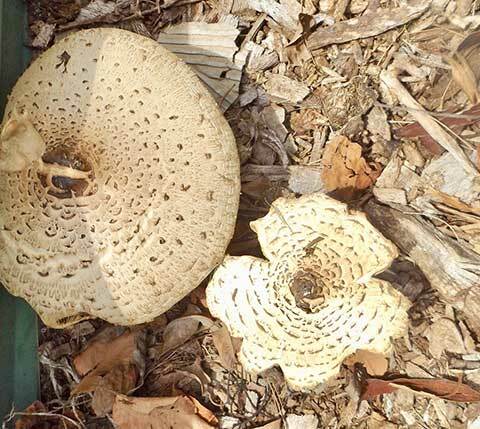 Next day they are flatter, darker and beginning to split, resembling a flower from above. The concentricity of the pattern is even more obvious. 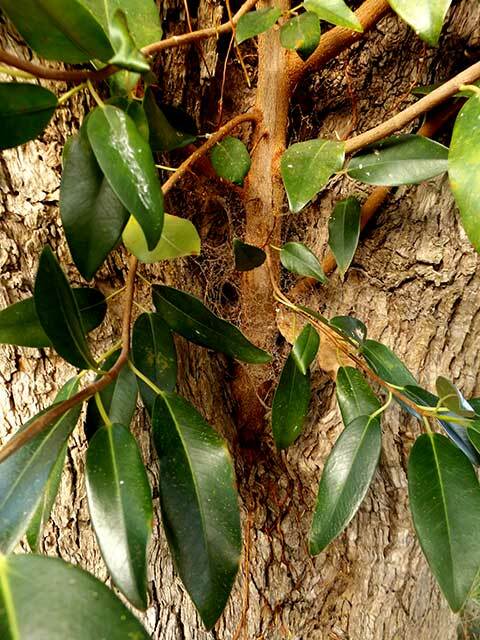 If the identification is correct, this is highly toxic raw, requiring hospitalisation! Although it is recorded to have been eaten after thorough cooking… why risk it?! 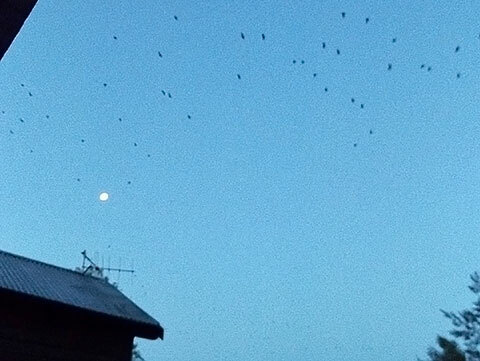 Every evening, after sundown, before dark, in what I guess we can claim as twilight, a seemingly endless stream of bats fly over my place, heading out for the night’s feeding. From my deck I watch the streams of flying dots, fascinated as the odd one turns back or the strands split up, until the sky is too dark to distinguish them. 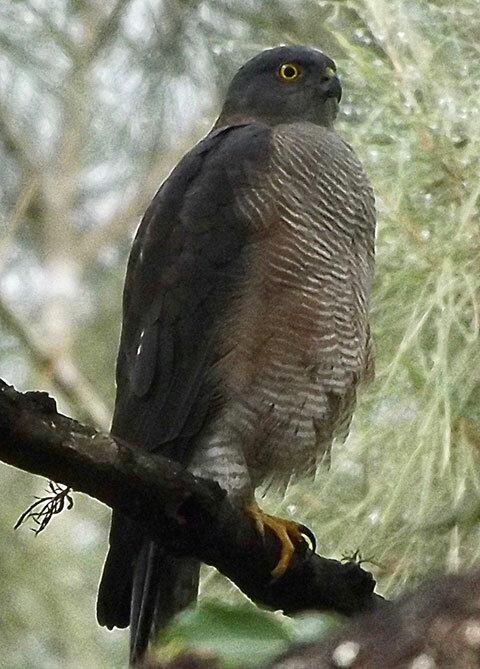 They are clearly heading for different feeding places, but how do they decide who goes where, and why do some individuals get their signals mixed up? 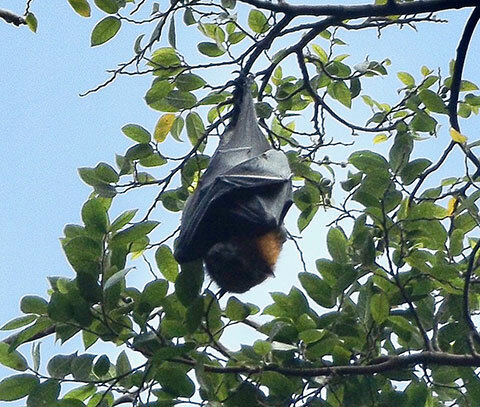 The ‘bats’ are actually Grey-headed Flying-foxes, and have about 20 different calls. They navigate by sight and find food by smell. 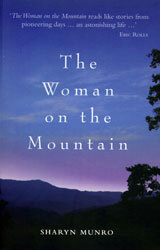 So maybe the meandering individual’s senses are just a bit off that evening. More numerous than my head can guess at, but in the thousands seems right. 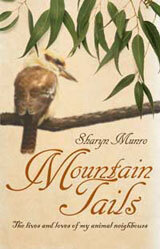 They come from their home in the regenerated Wingham Brush. 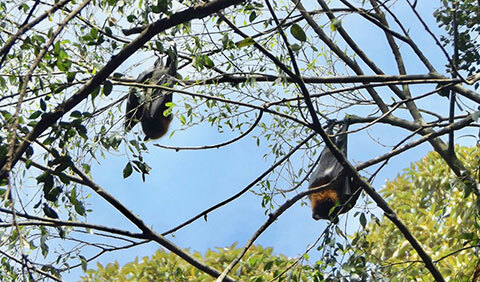 Thousands of Grey-headed Flying-foxes literally hang out there by day, small swinging parcels wrapped up in leather shawls. Even if you don’t look up into the Giant Stinging Trees, the Strangler Figs and many other rainforest trees, you can’t remain unaware that this is their place — the smell, for a start, and then the chattering and squeaking, the restless movements above, even when they are supposed to be sleeping. 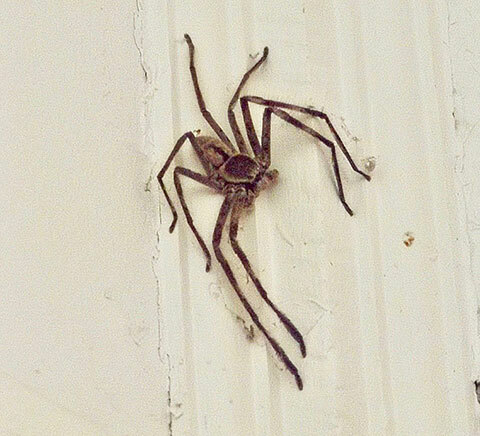 I find them fascinating, and delight in having such a thriving colony in my area. 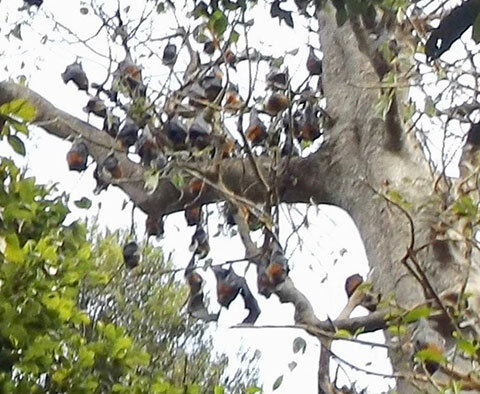 These ‘Flying Foxes’ — quaint name! — seem very social. 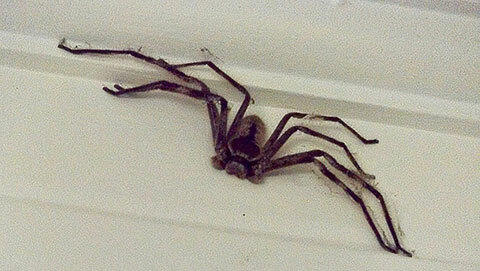 Some hang by one hand and air their wings, others visit next door camps. 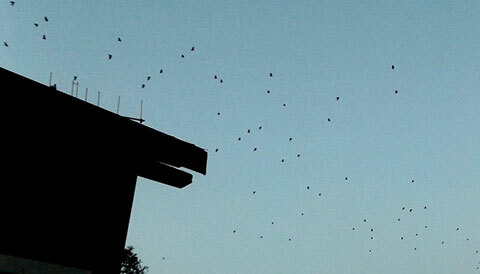 So each time I watch the flying dots pass over, I give thanks that at least one species still has enough habitat here. I hope enough destination feeding forests will remain too, of eucalypt blossoms and nectar, of native fruits like lilli-pillis. If not, we force them into ‘our’ patches and complain.